FW 190A-8 serial number 732108 shot down near Padborg 5/3 1945. The aircraft belonged to I. / Erg. JG 1 and was coded White 7. Flying Instructor Fähnrich Josef Quarda was flying together with two more fighters and made a dummy attack on a German troop transport train that was just arriving at Padborg railway station at 14:00 hrs. The flak onboard the train opened fire and Quarda`s FW 190A-8 was hit and burst into flames and crashed to the ground at Bov Mark near Faarhus. 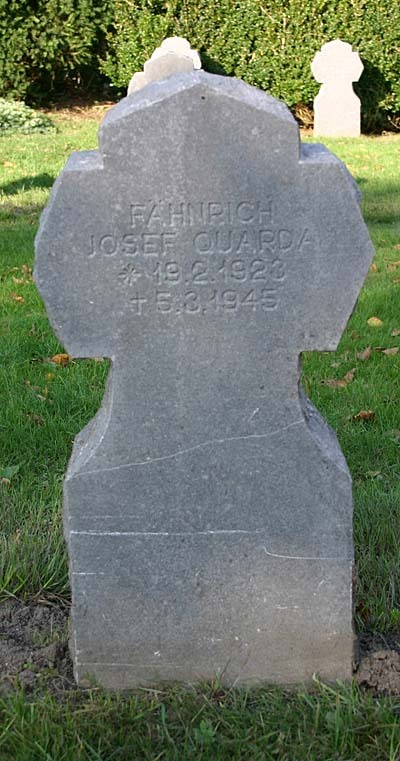 The aircraft was a 95% loss and Fähnrich Josef Quarda died. His body was taken to the chapel at rest at the cemetery in Flensburg. He was laid to rest in the Friedenshügel Cemetery in Flensburg. Sources: LBUK, WASt, RL 2 III / 1199.